Last spring, we had plans to redo our front deck, and in preparation for that, I was planning to move a massive, well-established hydrangea. This plant has been in its spot for a very long time and each summer we've been here, it reaches a height of about seven feet. I told my husband, if we are going to move this, we need to do it while it's still dormant. The clock was ticking as green stems and buds were already forming. It needed to happen...soon. But even in its sleepy post winter state, it was huge, and I was trying to figure out ways to lighten the load as much as I could. Out came the pruners. I cut back the entire bush by about twelve inches. I knew that pruning it in early spring meant that I was cutting off the bloom buds, but I figured I wanted the plant to put its energy into growing roots in its new home instead of flowering. In the end, our deck still sits on the project list, and I never did move the large shrub, but I did decide to try something new with my pile of hydrangea limbs. I dove into the world of propagation. I had read articles in the past about how easy it is to propagate hydrangea from cuttings, so I decided since I had this massive pile of test subjects there was no harm in trying. My boys helped me pick out the healthiest looking green stems, and we went to work. Most of them potted up in four-inch pots, but I did also try rooting about twelve stems in water. I am happy to report that both methods resulted in new plants. All in all, I managed to cultivate about three dozen sproutlings. Many of my babies have found new homes through gifting and plant swaps, but I still have two dozen hydrangea in my nursery garden. Even better, today, one year later, most of them are pushing blooms. It's pretty exciting. With all of the success I had with my own shrub, I am thinking it's time to seek out neighbors who wouldn't mind sharing a branch or two with me. Having a few more varieties would be fun. So want to give it a try? Here are the steps I followed. 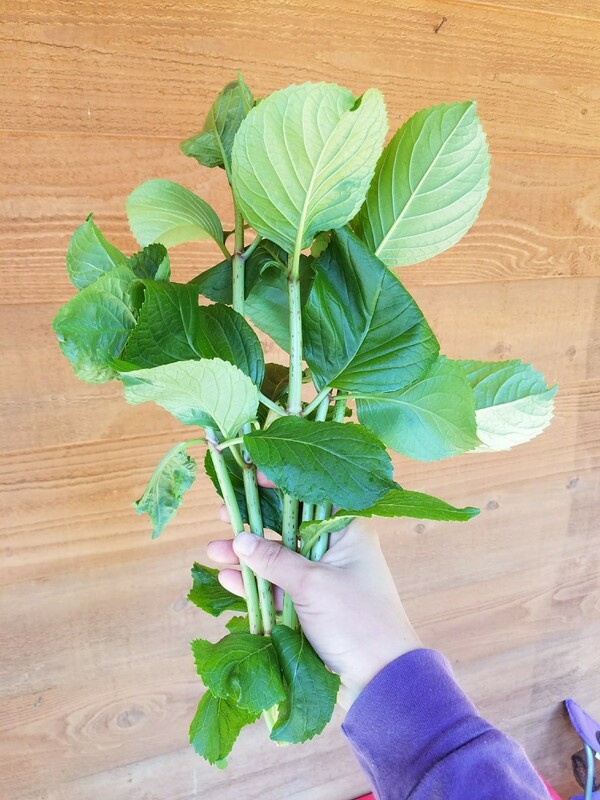 Gather healthy looking green stems. Rooting on new growth is a must. So make sure it's green. If leaves have begun to open, cut back all but the top pair. Another step that I skipped but have seen recommended is to cut the tips of the leaves off. It will encourage more energy to go to the roots. Plant your stems. I used four-inch garden pots I had on hand. Insulate. 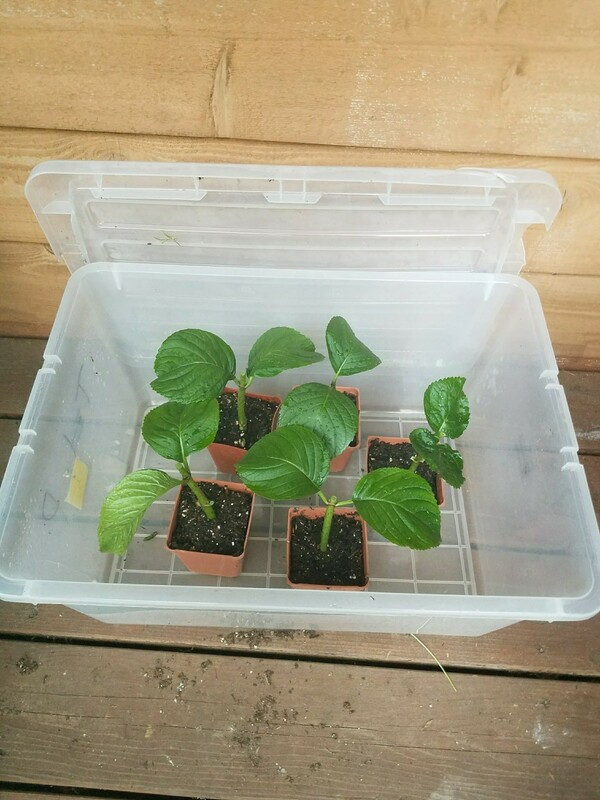 They like a humid climate, so I used an inverted clear storage tub as a miniature greenhouse. Hydrangeas love a shaded well-watered environment, so make sure to water them often. If the leaves start drooping, check to see if they're thirsty. Prepare the cuttings the same way as described above. Put them in a container with a few inches of water. Keep your bucket of cuttings out of direct sunlight. Mine sat on my front porch. Our home is East facing, so they were in the shade by the time the heat of the day hit. 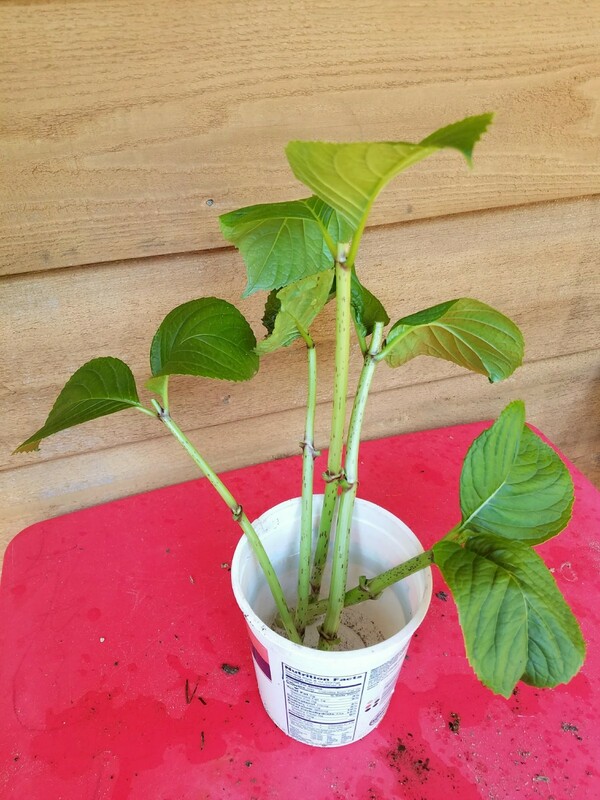 Once roots form, transplant them into a pot and water them in. Make sure to water often until their roots become established in the soil. And there you have it. I left my cuttings in the four-inch pots all summer. A few didn't make it through the heat, but that's okay. When it comes to any kind of propagating, you should never expect a 100% success rate. Hydrangeas are shade loving plants, so make sure you put your tender young plants in a protected spot, not in direct sunlight. I overwintered a few plants in small pots, but most of them went into an empty raised garden bed in my backyard. I figured they'd have better protection and more consistent nutrients/water if I planted them there. It worked! Every single one of those plants survived winter, and like I said most of them even have blooms forming. Hopefully, this will inspire you to go visit your friendly neighbor and ask for a cutting. Have fun! Mother to three littles, chicken farmer, baker, crafter, herb cultivator, plant swap addict, musician and sun plant lover learning to grow in a shady forest.